Plants associate with an infinite number of microorganisms that interact with their hosts in a mutualistic or parasitic manner. 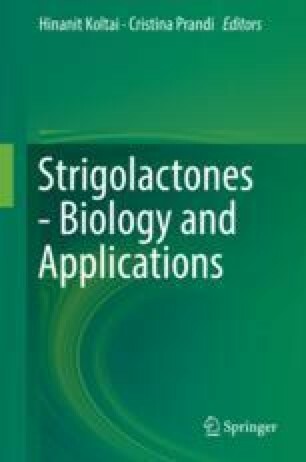 Evidence is accumulating that strigolactones (SLs) play a role in shaping these associations. The best described function of SLs in plant–microbe interactions is in the rhizosphere, where, after being exuded from the root, they activate hyphal branching and enhanced growth and energy metabolism of symbiotic arbuscular mycorrhiza fungi (AMF). Furthermore, an impact of SLs on the quantitative development of root nodule symbiosis with symbiotic nitrogen-fixing bacteria and on the success of fungal and bacterial leaf pathogens is beginning to be revealed. Thus far, the role of SLs has predominantly been studied in binary plant–microbe interactions. It can be predicted that their impact on the bacterial, fungal, and oomycetal communities (microbiomes), which thrive on roots, in the rhizosphere, and on aerial tissues, will be addressed in the near future. Members of a transmembrane transporter family. They often consist of multiple subunits comprising transmembrane domains and membrane-bound ATPases. Hydrolysis of ATP by the ATPases fuels energy-dependent translocation of substrates across membranes. Diverse order of Gram-positive, anaerobic bacteria, which have a mycelium-like, filamentous, and branching growth habit. Some species form root nodule symbiosis with plants of the Fagales, Rosales, and Cucurbitales. Tree-shaped hyphal structure, formed by arbuscular mycorrhiza fungi in root cortex cells. These structures release mineral nutrients to apoplast between arbuscule and host cell and take up lipids, delivered by the host. Ancient symbiosis between most land plants and fungi of the Glomeromycotina. Endomycorrhiza, in which the fungus penetrates root cortex cells to form tree-shaped arbuscules. The fungus improves plant mineral nutrition and receives lipids and carbohydrates stemming from photosynthesis in return. Parasite or symbiont, which colonizes a living host cell and exploits the living cell for. Example for nutrients. N-acetyl-glucosamine polymer, which is the main component of fungal cell walls. Family of chemical compounds with several phenyl-rings often containing a keto group. They are widespread in the plant kingdom and act, for example, as flower colors, as toxic deterrents of pathogens, or as attractants of rhizobia in the rhizosphere. An industrial process producing ammonium from molecular nitrogen and hydrogen. The process requires a catalyst (e.g., iron) and high temperature and pressure (400–500 °C; 15–25 MPa). It is named after its inventors Fritz Haber and Carl Bosch. Plant pathogen, which first colonizes the plant in a biotrophic manner and then turns into a necrotroph. Thread-like structures, which form the body of fungi. The term microbiome describes the community of microbes colonizing certain niche including bacteria, archaea, protists, fungi, and viruses or their collective genomes. Interaction between a minimum of two organisms, in which both organisms profit from the collaboration. Parasite, which kills the cell of the host and feeds on the dead material. Root nodule in its earliest recognizable stage, from when cell division has started to a visible small white nodule, before the nodule is mature and functional. Oomycota is a group of filamentous protist with c. 500 species. The name derives from their oversized oogonia, which contain the female gametes. Relationship between at least two species, in which one of the two lives on the cost of its host and causes harm to it. Unit of asexual reproduction of fungi used for dispersal and survival (e.g. for plant-interacting fungi through winter, when hosts are unavailable). Spores are an integral part of the fungal life cycle. Narrow region of the soil, which is directly attached to the root and influenced by root exudates and sloughed-off plant cells. The rhizosphere hosts a specific set of microbes, which are influenced by the root activity. Symbiosis between plants of most legumes and bacteria belonging to the rhizobia or less frequent members of the Fagales, Cucurbitales, and Rosales and actinomycetes. The bacteria are hosted in membrane-surrounded compartments in cells of root nodules, which are lateral organs derived from cell division. The bacteria fix atmospheric nitrogen and provide the plant with ammonium in exchange for organic carbon.